Is The Cost of Getting a College Degree Really Worth it? If you look at the extremes on this chart, they tell a pretty poignant story in my opinion. 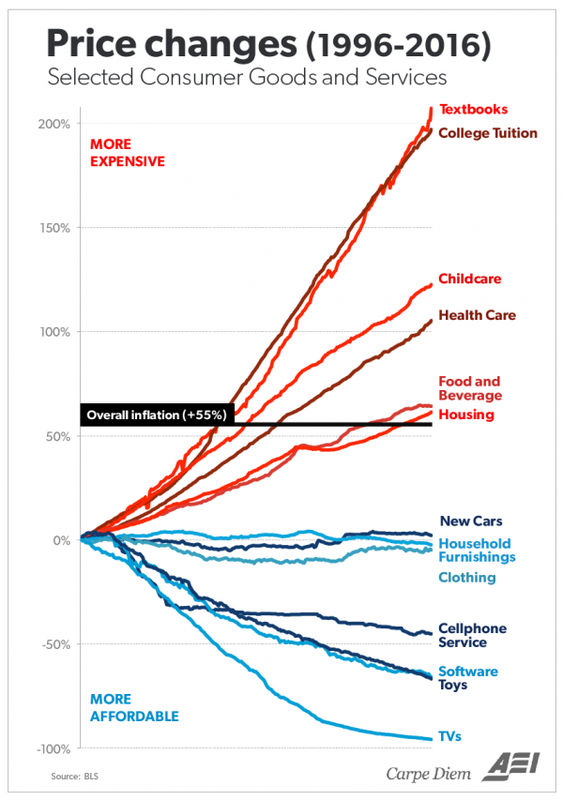 Many things that have increased in Use Value have decreased in cost (cell phone service and software) and some things that have decreased in Use Value have increased in cost (college tuition and text books). If you’re wondering why I would say that college tuition and text books have decreased in Use Value, let me explain. Outside of medical and law schools as well as the STEM categories, the benefit of getting a college degree has become nothing more than the table stakes required to even get a job interview with many companies. The question is, "How long will that prerequisite continue, and if so, to what degree?" From personal experience I'm seeing the requirement for a college degree start to loosen up. I work in the technology industry and what I'm seeing as more valuable than a college degree are technical certifications and industry certifications such as PMP (Project Management Professional). When you combine the right certifications, with an average or high IQ, the college degree becomes almost irrelevant. What's even more interesting is that I personally have promoted people or watched people (without college degrees) be promoted from technical or specialist roles into business leadership roles based on their aptitude, performance and emotional intelligence (EQ). BTW, many of these are positions that in the past would have required an MBA to land the gig. Hmmm…. When you start to think about it, from a dollars and cents perspective, that college degree starts to look more like a liability than an asset. In a world where information and/or knowledge is easily accessible via technology, it puts even more weight on the importance and value of emotional intelligence (EQ). (Assuming that you have at a minimum an average IQ.) This trend puts even more of a focused spotlight on the wisdom of spending large dollars on higher education. Outside of the specialties that I outlined above, in my opinion it seems to me like a lot of "squeeze" with "very little juice" to show for it.